Plain Dosa: Plain Dosa is a fermented crepe made from rice batter and black lentils. It is a staple dish in South Indian states of Tamil Nadu, Karnataka, Telangana, Andhra Pradesh and Kerala. It is also popular in other parts of India, and other countries like Sri Lanka, Mauritius, Nepal, Malaysia and Singapore. 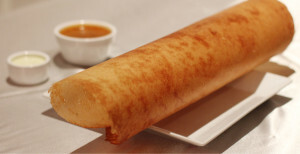 Plain Dosa can be stuffed with fillings of vegetables and sauces to make a quick meal. Plain Dosa is typically served with Sāmbhar, coconut chutney, ginger chutney etc. Combine the two, add salt, and let the mixture ferment in a lightly covered large bowl, for about 6-8 hours in a warm place. Add enough water to the fermented batter until you have a smooth, pouring consistency. Note: Make sure the batter is not too watery though; it should be thick-ish but fall off your spoon easily. Heat a non-stick tawa or iron griddle and lightly grease with the oil. Pour about 1/2 cup batter to the centre of the tawa. Drizzle about 1 tsp of oil around the edges of the dosa. Cook on medoium heat till the edges of the dosa starts to come off the pan. Use a spatula to gently lift the dosa and shape it to your desire. Plain dosa is ready to be served. Serve the hot plain dosa with coconut chutney and sāmbhar. If you have any queries regarding the Plain Dosa recipe, please leave a comment.